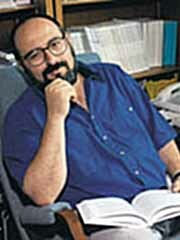 Panos Pardalos is one of the world’s leading experts in the emerging field of global optimization. This field addresses a core set of problems that arise in a wide variety of computer modeling and simulation programs. Pardalos has developed mathematical algorithms to address these problems in such applications as missile targeting, telecommunications networks and gene sequencing. Under Pardalos’ leadership, UF’s Center for Applied Optimization has become an international resource for researchers in this field. Top scientists from Sweden, China, Brazil, Germany and Japan have visited the center in recent years to learn Pardalos’ theories. A prolific scholar, Pardalos has published more than four dozen papers in the last five years and been an invited speaker at 52 universities, conferences and institutes. He is founding editor-in-chief of Global Optimization, the leading journal in the field and editor of the Encyclopedia of Optimization, a 10-volume work that will contain more than 1,200 articles when it is completed.